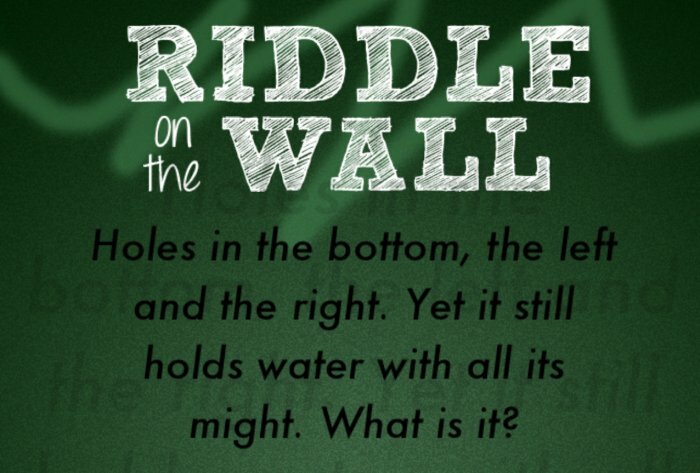 I am sure you love riddles just as much as we do, and that is why we are going to give you a helping hand with Riddle on the Wall. Answers, cheats, solutions: call them as you want, one thing is clear: we have the riddles solved and we’re sharing the knowledge. So if you got stuck along the way and had no idea what to do, our Riddle on the Wall answers should give you a helping hand. Riddle: Forward I’m heavy but backwards I’m not. What am I? Riddle: Holes in the bottom, the left and the right. Yet it still holds water with all its might. What is it? Riddle: Feed me and I live, give me drink and I die. What am I? Riddle: Born in nature shaped by man. When needed I can light the way. On certain days I top the cake. What am I? Riddle: What man walks over and man sleeps under. In times of war, he burns asunder. What is it? Riddle: With no honor among them, in the dark of the night. They take from others, what is not theirs. Who are they? Riddle: Double my number, I’m less than a score. Hal of my number is less than four. What am I? Riddle: This thing can turn without even moving. What is it? Riddle: Metal or bone I may be, many teeth I have and always bared. Yet my bite harms no one and ladies delight in my touch. What am I? Riddle: You can always see it, but it’s too far away to touch. Mountains rest on it, at sea it surrounds you. What is it? Riddle: It travels on waves on the ocean shore, and everywhere else you’ve been before. What is it? Riddle: Short and hot, often expressive. But shown to other it is rarely impressive. What is it? Riddle: I am tied at least once a day and forced to carry ten nails. I work hard without pay, and follow your many trails. What am I? Riddle: I have a hundred legs, but cannot stand. A long neck but no head. I ease the maid’s life. What am I? Riddle: It can bat, but never hit. It is next to a ball that is never thrown. It is good luck when found. What is it? With this being said, we have completed the first 15 riddles of Riddle on the Wall. Some pretty difficult to guess riddles, but we eventually made it. Make sure to check back soon as we will post more answers to these riddles! Update: As promised, we have published more answers for this great game, check them out here if you need any more help.